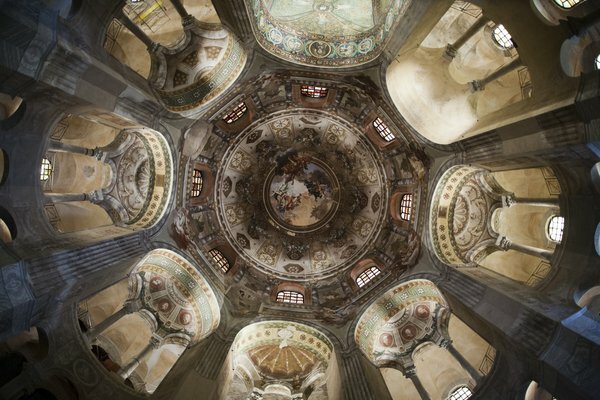 One of the most important examples of Christian Byzantine art in Western Europe is the Basilica of San Vitale in Ravenna, Italy. Inscribed on the UNESCO World Heritage List, the basilica is mostly renowned for its wealth of Byzantine mosaics, the largest and best preserved outside of Constantinople. Although somber from the outside, the church’s interior is brightened by the rich green, gold and blue colors of its mosaics, which are executed in the Hellenistic-Roman tradition: lively and imaginative. 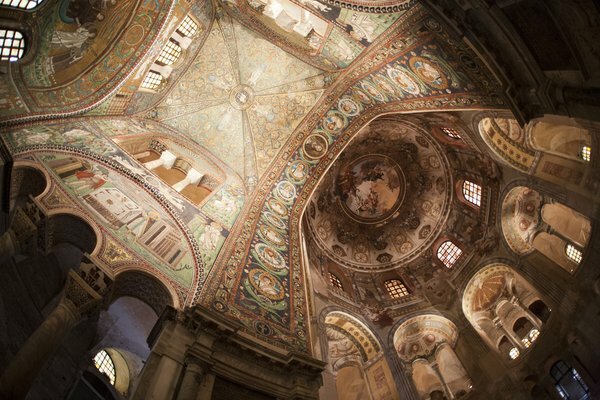 The architectural elements of the basilica, whether Roman or Byzantine, are decorated by mosaics that depict vividly landscape, plants and birds. The intrados of the great triumphal arch is decorated with fifteen mosaic medallions, depicting Jesus Christ, the twelve Apostles and Saint Gervasius and Saint Protasius, the sons of Saint Vitale. As for the side and end walls, they are adorned by mosaics representing scenes of the Old Testament: to the left, Abraham prepares to sacrifice Isaac in the presence of three angels, while the one on the right portrays the death of Abel and the offering of Melchizedek. Inside the chancel, two magnificent mosaics depict the Byzantine emperor Justinian with San Massimiano and a particularly solemn and expressive Empress Theodora, who was his consort.